Time for sport to show women the money. “Real, long-term change will only occur when all the elements align — media coverage, spectator numbers and funding. They feed each other and eventually we will reach a tipping point and a real shift will happen. We’re currently witnessing significant positive change in all these areas, and this is ahead of a massive summer for women’s sport. This might be the time.” says a WST Spokesperson. every man can become his very own male Agent of Change. Read the article here. Brands are missing out on reaching valuable new audiences by shying away from sponsoring women’s sports. Marketers have enjoyed a booming year in a number of sectors, whether driving the rising popularity of women’s sport, or responding to fresh brand opportunities provided by big mergers. Meanwhile, fast-fashion retailers have seen soaring sales, but the conversation might be about to change. Is enough being done to maximize the opportunities in women’s sport and are brands seizing the opportunity to invest? Eleanor Oldroyd and Goldie Sayers discuss WST ‘Real Value of Women’s Sport’ event at c 11.50 – listen here. New data shows women’s sport booming – read more here. When will England’s world-beating sportswomen get the credit they deserve? Read more here. With numerous high profile events on the way over the next year, new data reveals a tangible – and gender balanced – interest in women’s sport across the UK. read the article here. Sky Sports and the Women’s Sport Trust have partnered to encourage everyone to ‘show up’ and support women’s sport by watching, attending or playing. Why it’s time to #ShowUp for women’s sport. Tamsin Greenway announces Sky Sports and WST partnership to encourage people to watch, play and go to women’s sport. Read her article here. KL.FM, 21 May 2018 – read here. Sky Sports, 21 May 2018 – read here. Stylist Magazine, 22 May 2018 – read here. Sports Industry, 22 May 2018 – read here. Marketing Week, 22 May 2018 – read here. Boxing Monthly, 22 May 2018 – read here. Reuters, 24 May 2018 – Sustained audience growth for women’s sport will boost sponsorship. Metro, 12 June 2018 – Molly the Climber. Sky Sports, 12 June 2018 – Olympic gold medallists Kate and Helen Richardson-Walsh joined Isa Guha and Charlotte Edwards to discuss the #ShowUp campaign and the state of women’s sport in the UK. The 52 Blog, 22 June 2018 – There’s no doubt about it: the noise surrounding women’s sport is the loudest it’s ever been. Press Association – Preview feature and breaking news story. Sky Sports – Sky Sports News and Sky Sportswomen. Chris Evans Breakfast Show, 25 May 2018 – Danielle Waterman interviewed. To round off proceedings from The Morning Advertiser’s Maximising Sport in Pubs Conference, MatchPint co-founder Dom Collingwood chaired a round-table discussion on the growth in women’s sport and why it matters for pubs. WST Trustee Laura Weston was part of that discussion. Read more here. Interview with RFU development director Steve Grainger on talkSPORT. Sport Industry Daily – read here. Inside the Games – read here. 4 the Love of Sport – read here. True stories of women athletes have been severely lacking from the cinematic landscape but with the releases of ‘I, Tonya’, ‘Battle of the Sexes’ and the forthcoming wrestling film, ‘Fighting with My Family’ starring Florence Pugh, things are changing. Read the story here. WST tweeted and commented on Formula 1 deciding to stop using ring girls. New Zealand Herald – here. Good Morning Britain – here. Marketing week interview WST Trustee Laura Weston on brand sponsorship opportunities of the women’s sport sector. Read the article here. The New Indian Express here. World Boxing News – here. The Irish Sun – here. Sue Day, former England rugby captain and one of WST’s founding Trustees, has been appointed as the new chief financial officer of the RFU and to the RFU Board. Read the announcement here. Why are there so few blue plaques dedicated to women? Just 13 per cent of London’s blue plaque locations commemorate pioneering women. Isn’t it time we changed that? Read more here. WST Trustees Sue Anstiss and Kate Dale on how sport is changing and what still needs to shift. Read the article here. “Sporting bodies, athletes and teams need to take the time to communicate their commercial value”, says Co-founder Tammy Parlour. Read the article here (pg 38). Seven new trustees have been appointed to the board of the Women’s Sport Trust (WST) as it increases efforts to secure more coverage and funding for female sport. Read more here. Girls Active programme is seeking to change how girls engage with schools sport. “The scheme was hailed as the most inspiring national initiative at the Women’s Sport Trust awards this year.” Read the article here. Two aspiring sport photographers. Loads of talent. One experience of a lifetime. Read more here about the two women who were chosen earlier this year from a pool of 250 exceptional candidates for a special female-only internship with Getty Images. Developed in partnership with Women’s Sport Trust, Cerno Capital and Canon, the program was designed to encourage women to pursue a career in the mostly male-populated sports photography industry. When athlete talks to athlete all kinds of truths are revealed. That was the goal of the #OneChallenge film series, produced by Virgin Money Giving and the Women’s Sport Trust. Read the story on Virgin Money here. Read the story on Virgin here. The launch of the Barbarians women’s team is supported by World Rugby and the Women’s Sport Trust, the UK charity using the power of sport to accelerate gender equality. and here for the Wales Rugby Union report. With the sustained investment, effort and success within women’s sport over recent years we want to understand more about the thoughts of the sports industry and community – what has been done, what more needs to be done and, of course, the success stories on and off the field of play. Read more here. Launched in conjunction with Women’s Sport Trust, Cerno Capital and Canon, the internship aims to support diversity in the sports industry and contribute to a more positive and varied portrayal in the media of inspirational sportswomen. GB Basketball promote the WST/Getty Images women’s sport collection is during their men’s basketball matches. WST Trustee Sue Day. Listen here. Jordanne Whiley’s exclusive interview with our Mixed Zone magazine is reported across various media channels. Read ITV, BBC, ESPN. Olympian and WST Ambassador Cath Bishop discussed women’s cricket world cup success, football and the work of WST. A chat about the Trust and all things women’s sport. Read the interview here. The Blue Plaque Rebellion took over Waterstone bookstores. Time to go shopping for the best stories in women’s sport. WST Joint-CEO Jo Bostock spoke to BBC Radio London about the launch of the Blue Plaque Rebellion campaign. Listen here. The Blue Plaque Rebellion campaign went live at Wimbledon with Judy Murray for the unveiling of a plaque to recognise one of the tournament’s greatest females. Watch the video here. “Richardson-Walsh is an outspoken ambassador for the Women’s Sport Trust, and is determined to make a difference when it comes to gender equality.” Read the article here. Who has the greatest impact on sport in this country? Top twenty of influential women, compiled by influential women in sport. WST co-founders appear at number 14. Read the article here. WST awards debuts at Troxy on the eve of being crowned Best Awards Venue at the inaugural Awards Awards, cementing its position as a venue of choice for awards organisers. Read more here. The #BeAGameChanger awards continues to grow. Read the article here. On the first every blue plaque to women's football. Watch here. Find out more about Anna Kessel's Blue Plaque Rebellion campaign here. #BeAGamechanger finalist Ruqsana Begum on demolishing barriers and reaching her goals. Read more here. Olympic medallist Anna Watkins on sporting game-changers who’ve been honoured for their achievements at the #BeAGameChanger awards. Listen here. Goalkeeper Maddie Hinch talks about the impact of Rio gold, and GB Hockey team nomination for the #BeAGameChanger awards. Listen here. BBC Sport - Kate and Helen Richardson-Walsh rove the audience. Minerva Rowing founder Jane Giddins and WST Trustee Sue Day talk about the upcoming #BeAGameChanger awards. This Mum Runs founder Mel Bound and WST Trustee talk about the upcoming #BeAGameChanger awards. Listen here. Alex Danson talks to Chris Evans about Rio Gold and her #BeAGameChanger Sporting Role Model nomination. Listen here. Rodney Hinds interviews Michelle Moore about the #BeAGamechanger Awards. What a year it’s been for Ghana-born sports broadcaster Benny Bonsu.Named as one of Okay Africa’s 100 Inﬂ uential African Women and shortlisted for the Women’s Sport Trust Media Individual of the Year for the #BeAGameChanger Awards, this week she talks to the Voice of Sport’s Michelle Moore. Read the article here. Awards like these are important in showcasing positive role models in sport and business. They shine a light on phenomenally talented athletes and people working in sport to create change and redress inequalities; thus helping to increase the number and quality of stories in the media, showcasing strong female role models. Read more here. Michelle Moore on London Live. Talking to Alex Beard about the #BeAGameChanger vote. Marketing Week round-up all the brand activity around International Women’s Day that looks to inspire, celebrate or support women and girls, featuring our partnership with Getty Images. Read here. WST co-founders chosen to be part of an exhibition celebrating the unsung heroes of LGBT History for their work in women’s sport. Read more about the exhibition here. See a pdf of the exhibition here. Getty Images’ Rebecca Swift is optimistic about how women will continue to be depicted in imagery. Read more here. Girl Power – has it come of age? Mel Berry looks at the profile of women in sport and how their imagery is being used in the industry. WST Trustee and ex-England Rugby Captain Sue Day talks about homophobia and sexism in women’s sport. Watch a clip here. The internship, which is offered in partnership with Women’s Sport Trust, Cerno Capital and Canon, will be a paid position in Getty Images’ London office and will run for one year from July 2017. Almost all females aged between 11 and 21 agree that women are judged more on appearance than ability. Read more here. Getty Images have teamed up with Women’s Sport Trust to tackle the sexist ways sporting women are portrayed in the media. Read more here. At an event hosted by the BBC as part of Women’s Sport Week in October 2016. Our #hashtag for the evening #CallTheShots trended at number 2 in the UK. The Women’s Sport Trust, the charity behind the second #BeAGameChanger Awards held last week, has said investing in women’s sport is an opportunity that firms will be ‘ kicking themselves’ for not taking up in five or ten years’ time. Read more here / and here. At last week’s Women’s Sport Trust #BeAGameChanger awards, Sport spoke to Microsoft’s Director of Sports Business Development, Stewart Mison about how digital is changing the face of sport. Read more here. Editor’s congratualtions to #BeAGameChanger Journalist of the Year Award winner, Sarah Shepard. Andy Murray has taken time out from the Italian Open to receive a prestigious sports award. “I’ve been called a feminist. If being a feminist is making sure that a woman is treated like a man, then I’m OK with that.” Read more here. Speaking at the Women’s Sport Trust Awards, Connor told BBC Sport: “It’s no good just having an elite game. Read more here. Speaking ahead of the #BeAGameChanger Awards, WST Patron Kelly Smith discusses upcoming FA Cup final. WST spokesperson Michelle Moore talks women’s sport and role models in The Voice Newspaper and on London Live News. “It takes courage for individuals, sports editors and organisations to do things differently and take risks…”says former England rugby captain and WST Trustee Sue Day. The announcement of the shortlists for the Women’s Sport Trust’s #BeAGameChanger Awards 2016 trended on Twitter in the UK for over 4 hours and reached over 5 million accounts. Women’s Sport Trust wants to raise media coverage and encourage global brands to back women’s sport. Underlining the importance of role models and the media in shaping aspiration, he said: “If we can’t read or watch the success of our female athletes how can we expect to create a better landscape for diversity in sport?” Read more here. #BeAGameChanger Awards 2015 receives industry-wide recognition. The UK Event Awards rewards the very best events, organisers and industry suppliers in the country. UK Event Awards, 2 December 2015. Olympian, journalist and Women’s Sport Trust trustee Janette Kwakye speaks to Health & Fitness magazine about how women’s sport in the UK is changing. Read the article here. Men’s sport does not offer the same value for money to potential sponsors. “Jamie Brookes, trustee of the Women’s Sport Trust, says women’s sport is significantly cheaper to access than men’s by “a factor of about 30”. Yet, he says, as far as value goes, “you are getting the same strength of characters, calibre, work ethic and connection to the community”. And those are all aspects of the sector that are of huge value to businesses.” Read the full article here. More than 40% of elite sportswomen in Great Britain have experienced sexism but only 7% have reported it, according to a survey conducted by BBC Sport. Women’s Sport Trust Trustee, Jamie Brookes, and others share some thoughts. Read/listen here. MERCY BROWN is set to represent Great Britain at the International Weightlifting Federation (IWF) Junior World Championships that begin in Wroclaw this month. Last month Brown took a break from her studies at the University of Loughborough to join an intergenerational panel at the Women’s Sport Trust’s #BeAGameChanger Awards where she spoke alongside Olympic gold medallists Lizzy Yarnold and Nicole Cooke, as well as former England cricket captain Baroness Rachel Heyhoe-Flint. Read more here. At London 2012, Nicola Adams became the first female to win an Olympic boxing gold medal. As part of Women’s Sport Week , Adams – recently awarded Role Model of the Year by the Women’s Sport Trust – talks about the impact successful sportswomen can have on the lives of others and explains why it’s important for women to be inspired by other women. Read more here. History making boxer on her future ambitions. Watch the video here. #BeAGameChanger Awards trended on twitter at Number one, and was viewed almost 6 million times. Alphonsi and Spencer were speaking at the 2015 Women’s Sport Trust #BeAGameChanger awards in central London on Thursday night. They were part of a star-studded guest list including Olympic skeleton champion Lizzy Yarnold, former England cricketer Rachel Heyhoe-Flint and current Test and One Day captain Charlotte Edwards. Read more here. Sport England’s ‘This Girl Can’ campaign has won a Women’s Sport Trust award for its depiction of ‘real women’, as boxer Nicola Adams bags the best ‘Sporting Role Model’ gong. Read more here. Britain’s female sporting elite attended the inaugural Women’s Sports Trust Be A Game Changer Awards last night. Is women’s sport finally getting its turn in the sun? Women’s sport is stuck in a horribly vicious circle – the media don’t showcase it, so companies don’t sponsor it and would-be fans never see it. Something’s got to give, writes Emma Barnett. Read more here. What a summer it’s been! 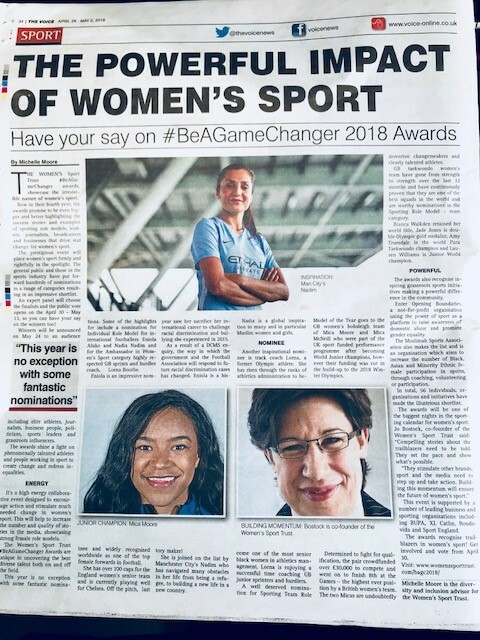 Since our #BeAGameChanger event in May we’ve had lots of great media coverage for the work of the Women’s Sport Trust. Download a pdf of some of the best bits here. England hockey captain Kate Richardson-Walsh reflects on Commonwealth Games and looks to the future of women’s sport in the UK. Read the her column here. BT Sport and the Women’s Sport Trust announce new partnership. BT Sport is building on its investment in women’s sport by becoming a media partner of leading charity, the Women’s Sport Trust. Read the article here. Matthew Syed talks to Jo Bostock about the reaction to Amélie Mauresmo’s appointment as Andy Murray’s coach. Read the article here. Judy Murray evoked a rather striking metaphor when she gave a rousing speech in London last month at the Women’s Sport Trust event, writes Matthew Syed. Read the article here. Hundreds of people from the media, sport and business were brought together to raise the profile of women’s sport last week. Clare Balding writes about the #BeAGameChanger event and the importance of sponsorship involvement in women’s sport. It’s time to get women in sport noticed. Alice Arnold writes of the recent Women’s Sport Trust #BeAGameChanger event featuring England Captains from football, rugby, cricket and netball. Read the article here. Where women were once opening the curtains, they are now opening the bowling and thanks to the Women’s Sport Trust, more change is on the way, reports Sue Mott. Read the article here. Katy McLean, Steph Houghton, Charlotte Edwards, Pamela Cookey and Judy Murray talk about the impact the Women’s Sport Trust is having on women’s sport. Click here to watch the video. On Wednesday in London #BeAGameChanger kicks off to promote women’s sport. We spoke to England cricket captain Charlotte Edwards, rugby skipper Katy McLean and Pamela Cookey, who leads England’s netballers, about the changes they have seen. Read the article here. A new grant-giving body run entirely by volunteers aims to encourage participation in women’s sport, from the grass roots to elite level. Read the article here. WST Co-founder, Jo Bostock, interviewed on whether it matters that a club which excludes women is hosting golf’s most prestigious tournament. Keeping the momentum going: What is the Women’s Sports Trust? A short introduction to the Women’s Sport Trust. Read the article here. The Women’s Sport Trust has plenty of athlete supporters who wouldn’t be where they are today without some powerful role models. Here, a selection name their greatest inspirations. Read the article here. Why are Anna Watkins, Jonathan Edwards and Kelly Simmons supporting the Women’s Sport Trust? Olympic gold medal winner Anna Watkins has backed the Women’s Sports Trust to capitalise on the success of London 2012 and boost female sport in the UK. Anna Watkins talks about why she has decided to become a Patron of the Women’s Sport Trust. The FA’s Head of the National Game and Women’s Football, Kelly Simmons, explains why she is supporting the Women’s Sport Trust. Jonathan Edwards explains why he has become an athlete supporter of the Women’s Sport Trust. Olympic gold medallist and mum-to-be Anna Watkins tells Kathryn Dobinson how the new Women’s Sport Trust can boost participation in women’s sport. Read the article here.